Thinking of buying a new seat?? Read this first! So my seat developed a tear on one side and cracking started appearing on the other. This quickly became my pet peeve as I cringed every time i looked at my seat. I started looking thru seats on ebay but they were either old/dirty or too expensive. And i figured this ebay seat is 11yrs old or older and will probably start deteriorating soon anyways. Then I came across this dude selling seat covers by “Northwest Classic” for $50-60. Not the cheapest considering entire seats on ebay start at that price but it was brand new and guaranteed to fit. Plus it gave me the excuse to go buy a staple gun! ($20 w staples at Walmart for the aircraft aluminum grade version - only $3 more than the regular one, don't be cheap). So I said eff it, lemme give it a shot. Bottom line: I love the way it came out! Perfect fit, nice and tight (thats what he sa..) and a great project and feeling of accomplishment. Very easy to do as well. Just grab a couple beers, turn the TV on and take ur time. 1) Do it indoors so the vinyl is warm and stretches easily. 2) The foam of my seat was soaking wet from water seeping into the tear athough bike was always covered. I suggest drying seat out entirely before putting the new cover on. 3) I picked out the $60 two tone black/black carbon one but they also have a $50 plain black one (stock) if u prefer. Nice! We had the seat re-covered on my husband's previous bike. Much more effective than trying to save the original vinyl. That looks great! I' plan on re-covering my seat but first I'll be modifying it a bit. This gives me hope. My '05 EX250's seat covering has been looking worn for a while now so I just went to Ebay and ordered the same replacement cover you purchased, the one with the "carbon weave" pattern on the rider's area. I won't have a chance to put it on the bike until after the Christmas season (probably) but when I do I'll come back to this thread and post a pic or two of my '05 wearing its nice new seat cover. I've done seat re-covers on all of my other bikes, two VFR800s and a GSF400. All of them turned out looking much better than original, so I'm hopeful of good results with this new seat cover. Thanks for posting about the Northwest Classic guys. Thanks for the post keV, it's good to know about this. DIY doable, obvious improvement, Ninjette or not. A leather cover on the way from England for my Duc SS800, Christmas present from me to me, a winter project. I got an opportunity to work on the EX250 so I decided to put the new Northwest Classic seat cover. When you see the pictures I took of my EX250's original seat cover you might think it looks to be in pretty good condition. Yeah, it looks good because the bike has always been kept in a garage, but the cover has a lot of wear around its perimeter that isn't apparent in the pictures. I took some pictures while I did the work and I put them into an "unlocked" Photobucket library file. Photobucket is a notoriously for its clunky operation, but it should (if we're lucky) allow you to browse through the pictures I took while installing the seat cover. After clicking on the link below you can quickly click through the entire library file by using only the arrow on the left side of the picture (once you're into the file you can "arrow" both ways). If you accidentally click out of my picture file you end up in the clunky-messy world of Photobucket. 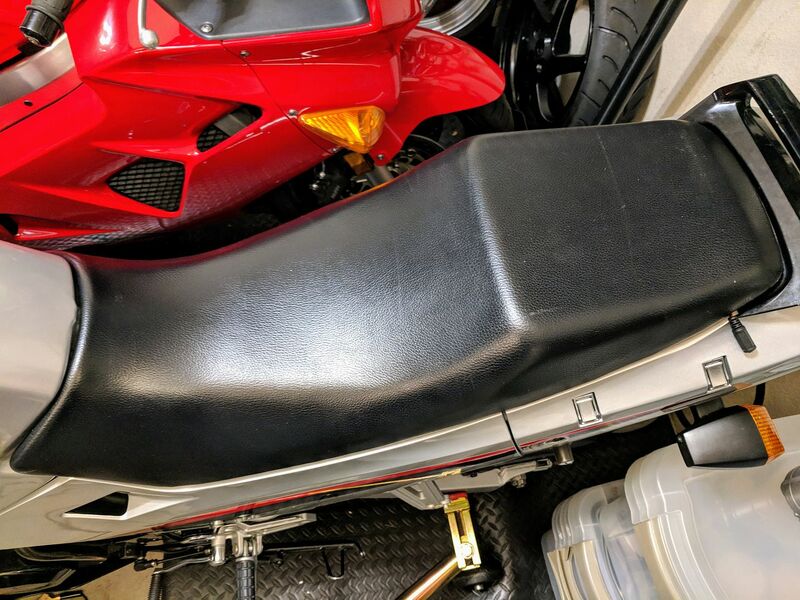 In the Photobucket picture file you'll see that the Northwest Classic people draw a temporary line on the new seat cover that shows exactly where to stretch the cover to meet the edges of the seat pan. Also on their directions sheet they give you the locations and order in which to attach the seat cover so that it ends up properly stretched and stapled. You can see by my results that the quality of the seat cover construction plus their directions on installing it make it possible to do a very good job. The whole process took only about an hour and a half. Last futzed with by greg737; December 17th, 2018 at 09:23 AM. Looks great! How do you like the two tone look? Pretty cool right? Yes, agree completely! I'm going to add a couple of on-the-bike pictures of the newly re-covered seat later today. Right now I've moved on to other motorcycle-related projects: I'm doing a Next-Gen Ninja clutch upgrade/swap to my '05 Pre-Gen Ninja, and I'm also installing a Next-Gen Ninja oil screen cover. I didn't see one either. It looks like he may have meant to link the picture itself to the gallery, so I added the link. If you click on the picture now, it goes to the gallery he is referencing.